One good analogy I have heard for a healthy Christian marriage, is that it is like a dance. The husband leads, indicating where he wants to woman to go, and she chooses to follow his lead. At the same time, the husband is careful to lovingly keep her from bumping into walls, and his desire is for her to enjoy the dance and to feel loved and close to him. The bottom line is that you both are supposed to be enjoying this dance, this marriage. The instructions to Christians in the Bible on marriage are meant to help a marriage to be a healthy and happy one which is pleasing to God. The key to this beautiful dance of marriage is to know how to dance. It is quite a sight when he is trying to tango, and she is trying to waltz, neither knows the proper moves anyway, and God wanted you to jitterbug in the first place. But thankfully, those steps we need to learn to do this God’s way are laid out for each of us in the Bible. The main theme of those steps are how to lead (Love) and how to follow (Submit Yourself). If you do not know how to love or submit, then learn how and practice, and seek God to help you in this. Until you get these basic steps down, you will not experience marriage the way that God intended it to be. But sometimes, intentionally or unintentionally, someone steps on somebody else’s toes. Two different people, sharing one life and one home, are bound to have disagreements. Regardless of if your spouse seems to be following their instructions from God, each of us as Christians are under our own instructions from God to follow. If your husband is all-around unloving to you, you still need to try to submit to him. If your wife is all-around not submitting herself to you, you still need to try to love her. We are each accountable to God for our own actions, and really it is our relationship with God that is the reason we know we should submit or love. The commitment to love your wife or submit to your husband cannot be based on their actions towards you, but rather must be a commitment based on your desire to show God you love Him by obeying Him. These instructions are given to husbands and wives by God, so this is all a matter of obeying God. While your spouse is imperfect, God is perfect, and will never let you down. And when you try to submit, or try to love, because you want to obey God, this is what God will help you to do. Like many things, if you want to please God, to show Him you love Him by obeying Him, then He will help enable you and change you so you can do so, for we cannot do anything apart from Him. And it remains the job of each husband to love his wife, and the job of each wife to submit herself to her own husband. Wives, submit yourselves unto your own husbands, as unto the Lord. For the husband is the head of the wife, even as Christ is the head of the church: and he is the saviour of the body. Therefore as the church is submits unto Christ, so let the wives be to their own husbands in everything. To understand what “head” means in this verse and to properly understand this entire analogy, Please Read and Go Here First. As was explained, the term “head” here is part of an illustration of the head of a body, and the rest of the parts of the body. In summary: Christ is the head of every Christian, who are His body, and the husband is the head of a wife, who is like his body, and God is the head of Christ, who is the fullness of the Godhead bodily. Now that you have read about Heads and Coverings, let’s go through this section of Ephesians 5, and it’s symbolism. This is the best analogy for marriage, as it is God’s analogy for marriage, as given in the Bible. The husband is like the head of the body, he is the eyes, the ears, the nose, and the mouth. 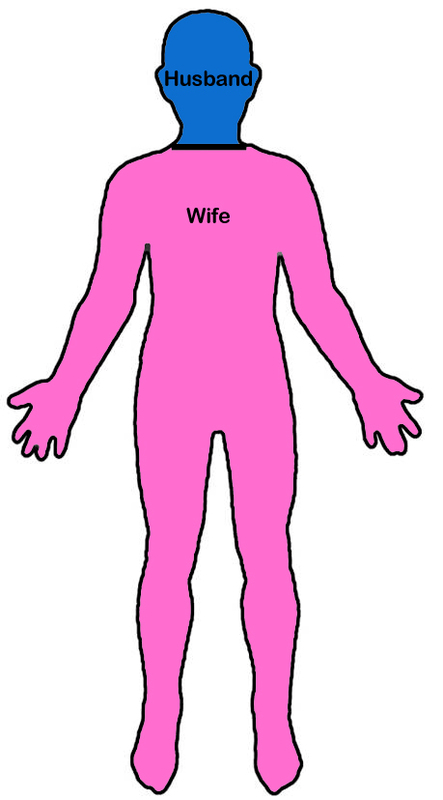 The wife is like the rest of the body parts, the arms, the hands, the feet, and the torso. Beyond the head taking care of the needs of the body so it is fit to follow the head’s leading, the head also wants its body to look nice. Beyond necessity, is taking satisfaction in that the body is clean, dressed nicely, is well-kept, at least presentable, but beyond this, the head wants to look in the mirror and see itself and it’s body as beautiful. When the head sees the body, the head wants to be pleased and feel good about the view. (This is a moral beauty, to be glorious, holy, without spot or blemish, washed in the Word of God. For those who say the husband has an obligation to be a spiritual leader to his wife, this is how, by washing with the Word). The body, conversely, feels a large amount of sensation from inside itself, and from the skin outside, and automatically sends this information to the head. The body has needs, for care, for energy and food, for rest, and tells the head how it is feeling. The body tries to follow what the head wants, trusting the head. But the body cannot follow the head if it cannot find the strength to, or if the head wants the body to do something it is not capable of doing. Like the head might tell the body to do a chin-up, and though the body tries to, it cannot. So if the head wants the body to be able to change to do a chin-up, then the head will have to patiently work to change the body gradually, to enable the body to be able to do a chin-up. And that is the gist of Ephesians 5 on husbands and wives, and on love and submission. The fact is that a husband and wife are one flesh, like 2 people in one person. God joined them together when they became married. They affect each other automatically, need each other implicitly, and must work together in order to be healthy, happy, and at peace. And while they are different, and have different roles, neither one is much without the other. What is a head without a body? What is a body without a head? Surely they were designed to be joined together as one flesh, and function as one. As for problems in marriages…. I wonder if we could see couples as one body, what would we see? Perhaps… bodies bruised in places, dirty, dressed in something old and worn, and weak, but still trying to carry on to where the head wants to go, or a body with a head that seems to be straining desperately, reaching and jerking, trying to decapitate itself, by sheer will. Perhaps the hands feel their way up and try to pull the head off, finding the task impossible, as we see the closed eyes of a head lost inside itself trying to block out reality, or perhaps a body feeling its way around aimlessly, like the head has no control over where the body goes, or like the head is blind… Is this what some Christian marriages look like to God? God works equally in the minds and in the hearts of Christians, so there is balance in this illustration. Some people don’t know this, but the Bible teaches that 1. thoughts arise in the heart and 2. that the heart can reason. Nevertheless, the mind also reasons with thoughts. So this is balanced. But while both the heart and mind can reason with thoughts, the heart is known more for feelings. I don’t know about you, but I find that feelings can be deceptiveand misleading at times. Emotions can cause pain, and sometimesit takes thinking something through in order to get emotions undercontrol. In other words, that sometimes the mind needs to settledown the heart, thinking of hopeful things to comfort it with, andbattling misperceptions or lies with thoughts of truth. While thehead perceives situations and the mind draws conclusions aboutwhat is happening, the heart soon reacts with feelings andemotions about the conclusions the mind has drawn, andsituations the head has perceived.This same interaction may be another part of being one flesh inmarriage. And if so, then if the heart of a wife is in emotional pain,then it is good for a husband to try to calm her heart, the same as ifit was his own heart feeling pain and in need of attention. Alongthe same lines, if a man’s mind is tired and needs a rest frombusyness, then a wife should give him rest, same as if her ownmind was exhausted. Also at times the mind may have considerthoughts or ideas of possible actions which conflict with what theheart needs, wants, or feels is right, and so a person may have toweigh out their thoughts against their feelings to make a decision. This same sort of interplay and balance also can occur between ahusband and wife in marriage. For they are one flesh, one person. And so slowly, this illustration draws closer to a better understanding of “love your neighbor as yourself” and “love your wife as yourself” and “love your husband as yourself”, as in this illustration, your spouse is in fact also your own self, as you are one flesh. While some women may try to force their husbands to love them, generally this does not work, because the ability to love unconditionally comes from God, so it is futile for a wife to enable or make an unloving man to love her. The best thing she can do so he finds it easier to love her is to submit to him. When women don’t try this, they often resort to arguing verbally, which is just a negative consequence of the fall, and comes from her sin nature. See the article on Gen 3 desire here. Also mentioned in that article, is the topic of men dominating women, another negative consequence of the fall into sin, and when men try to dominate their wives, or women, this is also out of his sin nature. See the article on submission here. Some men seem to think it is their job to make sure their wife submits to them, by forcing her by various means to do what he wants, whether by violence, force, threat, fear, manipulations, deceptions, trickery, etc. This is called dominating, and it is something a Christian husband has no authority before God to do to his wife. It is this sort of behavior, out of the sinful nature, which is physical, emotional, psychological, even sexual abuse of women: and what is recognized as the legal crime of Domestic Violence (in the United States anyway). And a review of the literature on Domestic Violence will tell you that it revolves around one thing, which is a man seeking to control his wife, to rule over her. “He will rule over you” of Gen 3 has been as much of a curse for all of humanity, in every culture, in every time period, as has mankind’s tendency to break the 10 Commandments, to sin, and need a Savior. The fact that much of history, and many cultures today, still are rife with men unjustly dominating women, does not mean that this is not a sin. It is surely not men treating women as men would like to be treated, and so violates the command to love your neighbor as yourself. The longevity with which this sin has been carried out in the world in no way changes that it is a sin. That a man can succeed to get and keep control over his wife, to her detriment, in no way changes that it is a sin. Success at a sin does not prove any morality to the task, any more than a well-planned bank robbery. That women are weaker only shows that yes, they can be dominated, not that they should be dominated, nor that God ever wished for them to be. If there is one major theme in the New Testament, even in the whole Bible, it is of Christ, and His Bride. What do you see in the story of Christ and the church? Following the Jewish custom of betrothal, we are a bride betrothed to Christ, who will wed with Him at the marriage supper of the Lamb. The Son has the bride drawn to Him by the Father. But never does the Son force anyone to become betrothed to Him, nor does the Father, it remains the choice of the girl to become a bride. We each feel drawn and convicted by the Holy Spirit, but to accept Jesus as our Savior remains our choice, we have free will, and God does not force us. When Jesus was here with his disciples, He did not force them to follow him. When He was with them, He was understanding, patient, and a servant to them, even washing their feet. And He gave His life so that they could live. He let them know what He wanted them to do, but He never forced them to do what He wanted. In our relationship with Jesus today, as Christians, He still never forces us to do anything. We choose to follow Him and to try to obey what He wants of us. Why? It is because He loved us. He loved us enough to pay the greatest price anyone could pay, His life, to have us. And all this for us, while we were still sinners, while we were not deserving of love, He loved us anyway, accepting us for how we were. We were evil, and perishing in our depravity and disobedience, but He still loved us. He loved us, first, before we ever came to understand His goodness. And because of His love for us, He made a way for us where there was no way. And does the Holy Spirit take us over like robots, forcing us to do His will, even if it is still against our own faulty mind and understanding? No! Slowly but surely, with patience and love and forgiveness upon forgiveness many times over, He teaches us, talks to us, shows us love, correct us gently with mercy, takes care of us and provides for all our needs, and comforts us when we sorrow. And all this, while we still sin, many times, in ignorance or even sometimes really knowing better. Does He ever give up on us? No! Does He get angry and yell at us about our many faults and imperfections? No, instead he is full of patience, and corrects us gently. And does the Lord ever lie to us, deceive us, or manipulate us so as to do what He wants? No! And despite that He is infinitely powerful and stronger than us, as He is God, and could “hit” us with physical harm, does He ever? No! Next time you sin, and Jesus does not use the power at His command to throw you across the room or hit you, remember that. Because He could, but He will not, because He is Good. And because of His goodness and His righteousness, His love and His mercy, our Lord does no such thing. I have heard it said that the point of the entire creation was to make a bride for Christ, who would choose of free will to love God, and obey Him. How can it be that the choice of free will is any less what Jesus wants in our earthly marriages, if it is His Will in His own marriage to us? And because free will of the bride is what we know is true in our marriage to Christ as His Bride, in how each of us came to know Him and choose Him, and in how He treats us now as His betrothed… then shouldn’t the church follow Jesus’ example and try to do as He is doing? If Christian men want to be like Christ, then they should also be like Him in their marriages. He does not dominate, but rather leads and rules through servant-leadership. We follow Him because He loved us, and He came as a servant. To be like Christ, Christian men need to do the same. Servant-leadership is the only Biblical and righteous option which Christian men have been given for how to lead their wives. And as Christ as our leader made us to have freedom to submit to Him or not, Christian men must do the same with their wives. This is what is Godly in a Godly marriage. Anything that involves the husband forcing the wife to submit, dominating her, is from the sin nature, and is not what God has instructed Christian husbands to do. And in the same way that Christ first loved us, and now we learn to submit to His will, as He continues to love us as we make mistakes… there is much merit in Christian men first loving their wives, and as wives learn to submit to their husbands, for husbands to continue to love them even as they make mistakes. In the beginning, God made 2 intelligent orders of beings. First God made the angels, more powerful than mankind, who were meant to serve God by being ministers to mankind who would receive salvation. Second God made mankind. While the angels were more powerful than mankind, and were made first, a big part of their job for God revolved around helping mankind, who was the weaker order of beings, who was made second. And we know it is the fallen angels, the evil spirits, who now hate and war against mankind. They were not content to be ministers to mankind, but instead seemed to have sought power over mankind, and wanted this more than to obey God. They abused and still abuse their power, as the stronger order God created them to be. Is it dissimilar to the history of men and women? From the beginning, woman was made as the second and weaker gender of mankind. For first God made Adam, and then from Adam, God made Eve. And the history of mankind since the fall, since mankind gained a sin nature, has been for men to dominate women. That a husband would “rule over” his wife is listed as a clear negative consequence of man’s fall into sin. That men have dominated and abused women all throughout history, has shown that men have seemed to want power over women, more than to obey God by loving their neighbor as themselves. Men were made by God as the stronger gender, but have abused and still abuse their strength. In both cases, the stronger and inherently more powerful was made first, and the weaker was made second. In both cases, in disobedience to God, the first-made has abused their power as the stronger. But today, God has told Christian husbands that their job is to love their wives, and to be servant-leaders, a job of helping the weaker kind of mankind, who was made second. God has shown Christian men that women are equal heirs of salvation, vessels of the Holy Spirit, and to be apportioned honor, the same honor that God has apportioned to men. God has told us to love our neighbors as ourselves, and that there is no male nor female in Christ Jesus. As for Jesus Christ and His Bride, the church, He also was the first among many brethren. The only begotten Son of God, Jesus was the first of many adopted brothers and sisters, who make up his Bride. And He came not to be served, but to serve. He accepted God the Father’s will, to do for us what no one else could do, and obeyed God. He sacrificed Himself for us, and did not use the power He had thinking of His own life, to save Himself from death, but rather was selfless and thought of us, suffering for us in love. And by His love for us, and all He has done to help us, He has saved us. And now He enables us to help Him, as His body, to do His work. And even right now, He sits at the right hand of God the Father, hearing our prayers and advocating for us as our high priest, for our welfare. Surely where all of creation, of every created order of being, has failed, God came to us and showed us His Perfection, that He could do what we all failed to do. He has shown His perfect love towards the weaker, the Bride, who was made second. And most importantly, God made a way for us to be able to become like Him. He enables us to do what we cannot do without Him. He put His Spirit in us, and gives us His power, so we can become like Him and carry out His perfect will. Glory to God, and the Lord Jesus Christ!! !